A cold frame is a small greenhouse that is used to extend the growing season for gardeners and also get a jump start on seed germination. You will learn how to build a small cold frame in this article. The typical cold frame is (3) foot wide by (4) foot long, but they come in as many shapes and sizes as one’s imagination. They can be built as a temporary structure or as a permanent one. The structures can be built from leftover materials to help reduce cost or they can be purchased from many places online. The concept behind the cold frame structure is to allow the sunshine to come through a transparent top, which provides light and also will heat up the inside area to help plants to grow. The structure can be placed over areas that you want to get a jump start on germinating seeds or early planting. Common produce to plant in cold frames are salad greens and root vegetables. These structures can be built to where plants or seedlings are moved in and out as the need arises. One of the problems that should be watched out for is overheating of the plants. 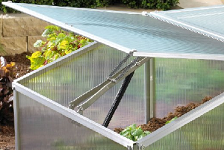 The roof or top of the cold frame is normally attached to the body of the structure with hinges so the top can be propped open to insert or remove plants, and to let out excess heat. It takes a watchful eye to be sure you do not cook your young seedlings, it can be surprising how warm the inside can get even during the winter months. One way to take care of this problem is to use an automatic opener that will open the top of the cold frame when it gets warm and close as the temperature starts to drop. You may think that this would be something that would require batteries or an electrical source, but no, it is accomplished by the thermodynamics of wax or other materials that will melt and expand as the temperature increases and contracts as the temperature cools. This expanding and contracting is enough for a cylinder that is filled with this material to push a rod and pull a rod to open and close the top of the cold frame. Be careful to not let the wind grab the top of the cold frame, by attaching a small chain or cord that will prevent damage to the cold frame top and possibly your plants inside. The first method on cold frame construction comes from Vegetable Gardening For Dummies. “A cold frame is, essentially, a mini-greenhouse. By growing plants in a cold frame, you can harvest cold-tolerant vegetables year-round, even if you live in zone 5 where winter temperatures can dip as low as –20 degrees F. Cold frames are also great for hardening off seedlings, growing cold-tolerant flowering annuals like pansies, and rooting cuttings from your garden. Build a cold frame to extend your growing season. Build a 3-foot-x-6-foot box from untreated lumber. Cut the box so that the back is 18 inches high, sloping to a front height of 14 inches. This sloping angle enables more sun to reach the plants, and it sheds rain and snow as well. Hinge an old window sash over the top of the cold frame. If the window sash has no glass, use fiberglass or polyethylene to create a sealed growing environment You can insulate the cold frame by adding rigid foam insulation around the insides of the cold frame and by weather stripping along the top edge. In extreme cold, cover it with heavy burlap or an old blanket. Remember to uncover the coldframe when the sun comes out so the plants can warm up again. Position the cold frame so that it faces south. If the south side isn’t practical, then use the west, east, or north side in that order of preference. It’s best to put a cold frame next to a structure, such as a house, to protect it from cold winds. The second method is from a Mother Earth article on constructing a cold frame. Take on this relatively simple DIY cold frame project over the weekend to save money, extend your growing season and become a more self-sufficient gardener. A cold frame is a simple way to create an area with a stable temperature for giving seedlings a head start in spring and for holding on to the last cold-hardy greens in the fall. You can easily construct your own cold frame, using the pland and instructions found in Weekend DIY Project: How to Build a Cold Frame, and the diagram and charts below. As you can see, there are several ways to build a cold frame but the construction principles are about the same. This is a good weekend project to get a jump on the gardening season and some early greens to eat. 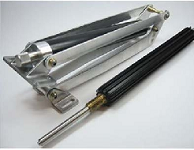 These are two of the top rated devices on Amazon for opening cold frames and greenhouse windows. Click on picture to take you to the Amazon site and product page. Wikipedia. Wikimedia Foundation, n.d. Web. 23 Feb. 2016. “How to Build a Cold Frame for Your Garden.” – For Dummies. N.p., n.d. Web. 23 Feb. 2016. “Garden With Cold Frames to Grow More Food.” Mother Earth News. N.p., n.d. Web. 23 Feb. 2016.